Today was a big day for me because I not only worked out once but I worked out twice. I woke up at 6:30 AM to go to my weight training class at my neighborhood gym. I was going to this class 2 to 3 times a week when I was “Shedding for the wedding” but then I stopped going back in August due to an injury. Since then I have been working out a lot but mainly doing bodyweight exercises when it comes to strength training. I finally am feeling better from my injury and decided it was time to hit the gym again. I was a bit nervous because it is always a little nerve-racking when you haven’t lifted weights in a while and you do it for the first time again. But strength training is an important component to overall health. The more you lift heavy things, stronger you get. And if you don’t use it you lose it. I had a hard boiled egg as my whole30 pre workout snack and then headed to the gym. I read a lot about pre and post workout meals on whole30 in It Starts With Food and I wanted to follow their directions as well as I could. My coach was very good with me and made sure I was real stretched out and loose before we did any exercises. She immediately noticed tightness in my hips and glutes and that my abs and backs were weak. Sad. But she did notice that I lost weight which is a good thing! Now I just have to tone it up. Overall the session went really well and I felt good. I am going to go back again next week. When I came home I had a post workout snack of tea and 1/2 a sweet potato. All that food made me full for breakfast but I had another hard boiled egg and some greens. With all the good food I had for breakfast I wasn’t hungry for lunch until around 2pm. I headed to the post office to mail Nicole from Apples and Arteries her NewYearNewGear gift. Then I went home and heated up some leftover beef and broccoli from the night before. So good! I thought that now since I’m 30 and more “mature” this wouldn’t happen. Um, wrong. The minute the class broke out into the first chant I was brought back in time to my teenage years and I started giggling. But I quickly got over it and surrendered myself to the class. It was really relaxing and beautiful. Lots of meditation and breath work. We ended the class with a partner meditation that lasted 22 minutes. Yes, I’m serious! It was crazy cool. It was my first time meeting Gurutej in person and she is such a nice person and a beautiful soul. 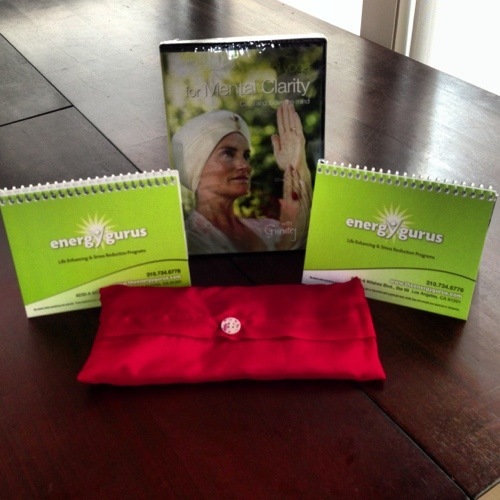 She even brought me a pack of yoga goodies to help me on my whole30 journey- a red chakra pillow for courage, yoga flip charts, and a kundalini DVD. Thank you, Gurutej! Beautiful yoga goodies from Gurutej. LOVE. The chakra pillow is BOMB. After yoga I felt very tired and relaxed. I also noticed that it was 9pm and I was hungry but not ravenous or starving even though I hadn’t eaten since lunch. Could this mean by body is starting to burn fat as fuel instead of sugar and carbs? I sure hope so! We drove home and I headed to bed. After two workouts I was feeling beat and had a big Wednesday ahead of me. I heated up a Beef Curry from Brian’s Bowls, made tea, watched a little tv with my husband, and went to bed. I used my new red chakra pillow and the scent of cinnamon was so relaxing and helped me drift right to sleep.What a day! What about you? Have you tried kundalini yoga? Do you enjoy it? Post in the comments and let me know! Thanks for sharing all of this. I can totally see you giggling in class too! You are so funny. You should come to meditation with me sometime soon. I can’t get enough of it!